Israeli shelling blamed for setting the plant on fire. Several supply lines from Israel have also been damaged. Israel's Channel 2 said that Gaza's electricity supply has been reduced by 90% since the start of the military campaign there. "Gaza's sole power plant has stopped working due to Israeli shelling last night, which damaged the steam generator and later hit the fuel tanks which set them on fire," Fathi al-Sheikh Khalil told AFP. An AFP reporter saw huge fires raging near the plant Tuesday morning, noting that fire department vehicles were still unable to reach the area. The damage of the power plant exacerbated the heavy damage to civilian infrastructure in Gaza already inflicted during the 22 days of the Israeli offensive aimed at stamping out terrorist rocket fire and destroying attack tunnels. Besides the power plant, Gaza also purchases electricity from Israel, but many of the supply lines have been badly damaged by the recent fighting, Sheikh Khalil said. "Five out of 10 of the Israeli electricity lines into the Gaza Strip were also damaged because of Israeli shelling, and maintenance still cannot reach the areas and fix them," he explained. Israel blamed Hamas fire for damaging some of the supply lines. Two weeks ago, Israel said that a Hamas rocket hit the power line that supplies electricity to Khan Younis and Deir el-Balah. It's not clear when Israel Electric Company workers will be able to repair the system, but they are apparently in no rush to do so. Prime Minister Binyamin Netanyahu has asked the IEC not to risk the lives of its employees in trying to restore power to the affected sector in Gaza, an operation that could take hours. One suggestion for action against Gaza that has come up numerous times in Israel – including from MKs – is cutting off electricity to Gaza, which Israel is still supplying. The Palestinian Authority currently owes the Israel Electric Company NIS 1.5 billion ($525 million) in unpaid bills for electricity. An examination of that debt by business daily Globes shows that the relative amount owed by Gaza was NIS 220 million ($62 million). Last month, the IEC filed a petition with the High Court demanding to be allowed to shut off electricity to the Palestinian Authority until the debt was paid – or to allow the IEC to seize customs and aid payments collected on behalf of the PA to pay off its debt. That case is still pending. Meanwhile, the IEC is still supplying electricity to Gaza, under orders from the government. The power is delivered to Gaza via 12 high-tension wires that are capable of delivering up to 120 megawatts of electricity. Experts say this is not enough for all the residents of Gaza, and in recent weeks residents have said that they have been getting electricity only 12 hours a day. 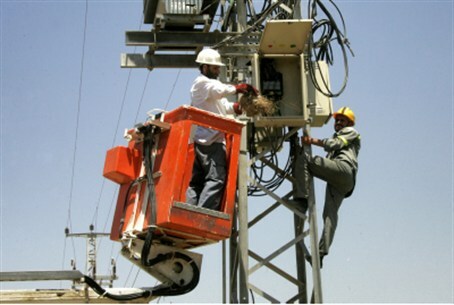 Along with the IEC's power, Gaza also receives electricity from a 140 megawatt generator which is under the control of the PA's Palestine Electric Company, which is run by Hamas operatives. The generator, which is currently operating, is maintained by a crew from German company Siemens. It had been damaged by IDF forces several times in the past, officials said. Prime Minister Binyamin Netanyahu has admitted to members of the Security Committee that harsh steps, such as cutting off the water and electricity to Gaza in response to the incessant rocket fire, are being opposed by the government's legal advisers. Following the admission, the Movement for Governability and Democracy harshly criticized the fact that the IDF is being limited in its operational capacity by the legal system, a situation that in the end harms the security of Israeli citizens. According to the legal adviser of the Movement, Attorney Simcha Rotman, "the international law that obligates in a time of war is the customary international law. In other words, the way that countries of the world conduct themselves in times of war." Palestinian Arabs deliberately cut electricity lines in the Dolev-Talmonim Bloc in Binyamin ten days ago, causing power outages throughout several communities over Shabbat. Power was finally restored since the early evening hours in Dolev, Talmon, Harsha, Neria, Horesh, Yaron, and Nahaliel. The terrorists uploaded footage of the attack on social media, confirming suspicions that the power cut was a deliberate assault on the Jewish communities in the region.